Yesterday, I wrote the first part in the 'Understanding the Budget' Series under The Explainer Series. In today's article, I am going to address some very important aspects of the Union Budget. Take a look at the table graphic below. This document titled, Budget at a Glance, is the best document to understand the components of the various types of figures in the Budget. The Actuals for 2013-14 may be represented as such but they STILL would be PROVISIONAL only (see notes below the table in the above graphic). This means that these figures are NOT the final figures for 2013-14 but are subject to further revision. In fact, the final figures for 2013-14 will only be available toward the end of Financial Year 2015-16 (or Fiscal Year ’16). Budget Estimates (BE) relate to the figures which the Finance Minister set out in his Budget Speech last year (i.e., on 28 February 2014) for the Financial Year 2014-15. However, all figures – related to revenue collection, expenditure, other allocations – are subject to change. These numbers are mere ESTIMATES and not actuals. As the year progresses, such figures may sometimes need to be revised. For example, if there is low industrial and agricultural activity (meaning lower economic output), tax collections may dip. This, in turn, will reduce the government’s Revenue Receipts. 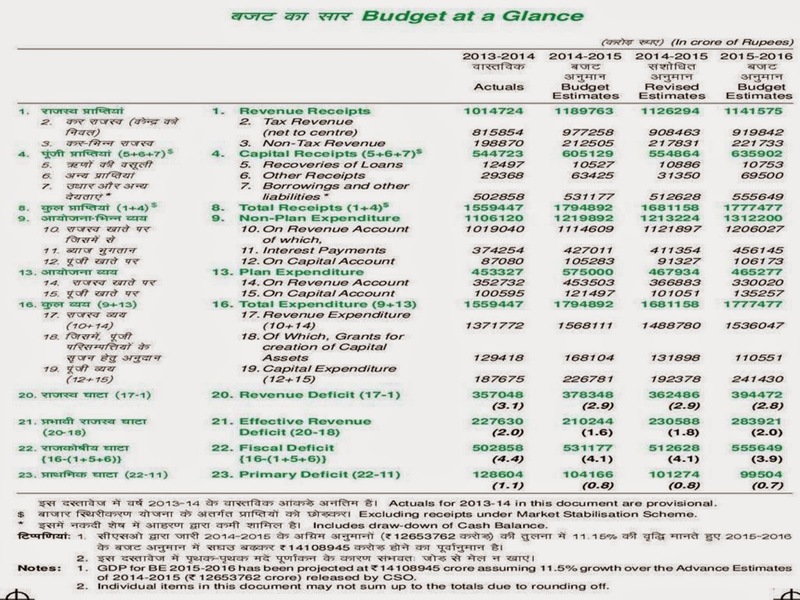 In the fourth and last column, you will find Budget Estimates for the coming Financial Year 2015-16. These figures reflect the various estimates made by the Government in terms of Receipts (including tax collections) and Expenditures (including interest payments and salary payments to government employees). What are the different types of accounts listed in the Budget? What is the Consolidated Fund of India? This is the most important account maintained by the Government of India. The Consolidated Fund of India contains all the revenues (tax and non-tax revenues) earned and all the expenditures incurred by the Government of India. No money from the Consolidated Fund of India can be spent by the Government without approval of the Parliament of India. What is the Contingency Fund of India? Contingency means ‘unforeseen’ or ‘emergency’. As mentioned above, all withdrawals from the Consolidated Fund of India require prior approval of the Parliament. However, sometimes there are emergency expenses for which the Government may not wait for the Parliament’s approval; like, expenses incurred to tackle a devastating flood/earthquake. In such cases, the Government of India will withdraw funds from the Contingency Fund of India. Once the expense is met, the Government may seek approval of the Parliament for such withdrawal. In short, the Parliament’s approval comes post-facto (i.e., after the expense has been made). However, after the Parliament approves such expense, an equal amount is withdrawn from the Consolidated Fund of India to be put back into the Contingency Fund of India. Public Accounts hold money that does not belong to the Government of India. Such accounts include the Employees Provident Fund and Small Savings Scheme. This money belongs to the general public but is held in Government’s trust. Whenever withdrawals are made from such accounts, the Government pays out the amounts without the Parliament’s approval. I hope this was easy to understand. Please share your feedback. Is 2015(28th February 2015 ) wrongly mentioned in the sentence written under the heading BUDGET ESTIMATES(BE) or is it correct? Please explain if I am wrong. Anudeep, thank you for the pointer! Corrected! Book Excerpt: Crusader or Conspirator?